Here we explore vital information, equipment, ingredients and other tools the bartender must have. Being the bartender entails more than pouring a few shots. It's an art. Therefore you need to know what you are doing when bartending. Importantly, you need to have the right equipment to make your job easy and enjoyable. Ø Cocktail bar equipment . Here you will find all the various cocktail bar equipment and barware you might need in your bar, from cocktail shakers, Boston shakers, optics, bottle openers and pourers. Check out our additional Cocktail Shaker Guide for an in-depth look at cocktail shakers. Ø Shaken or stirred - A guide to masterful cocktail mixing. Here we take a finer look at the techniques used in mixology, like blending, building, layering and muddling. Some of these techniques require some practice to perfect them so be sure you do some practicing. Also see our Cocktail Garnish Guide for must-know ideas on radical cocktail garnishes. Ø The Cocktail Guide. A one-stop quick guide about everything you need to know about cocktails. TIP: Excellent prices on a wide range of products. Visit the Cocktail Mixing Master Bar Store for all your bar equipment needs. Shipping across the globe! Also visit Amazon.com for a wide selelection of Bartending equipment - it makes for GREAT GIFTS!. 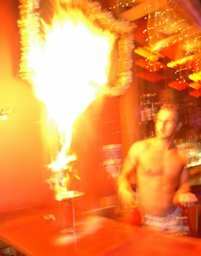 Ø Flair bartending - an introduction to flair bartending to get you going. Once you have mastered the basics of bartending, flair martending is the logical next step. Remember that you need to practice, practice, practice to become good. Ø Hangover cures . Did you know that milk thistle is a great hangover remedy. Here we show you how to stop that hangover in its tracks! Ø Bar jokes Tell it like it is. We are on a quest to collect and bring you the best bar jokes from around the globe. Tell us your best jokes. Ø Drinking games. We bring you the most popoular drinking games from around the world. Submit your own games and share it with us. You, as the bartender, is responsible for much of the enjoyment or not of your clients (or friends). Be friendly and provide a swift and accurate service as you serve the image of the bar you work at. This will also help to increase your popularity and your tips. Be confident and good at what you do. This of course takes practice but is well worth the effort.